Dr. Martin Luther King, Jr. was only 39 years old when he was assassinated; however, in his short life, Dr. King achieved so much. Among his accomplishments: the Montgomery bus boycott, the Prayer Pilgrimage for Freedom, the Youth March for Integrated Schools, the Albany Movement, the Birmingham campaign, the Walk to Freedom, the March on Washington for Jobs and Freedom, the St. Augustine movement, the Selma to Montgomery marches, the Chicago Open Housing Movement, the March Against Fear Memphis sanitation strike, and the Poor People’s Campaign. And more amazingly, Dr. King did all this through non-violence, by using his powerful voice and charisma alone. Between 1955 — when Dr. King took over leadership of the civil rights movement — and 1968, he delivered a staggering 350 speeches, speaking out against racism, racial inequality and social injustice. Whether he spoke to a gathering of 25 or thousands, Dr. King’s charisma and eloquence were captivating and, more importantly, motivated people to act. Indeed, his non-violent approach fighting for racial equality earned Dr. King the Nobel Peace Prize in 1964. But what made Dr. King such a powerful and eloquent orator? Was it his charisma or his words? Ordained in his final semester of college, Dr. King went on to deepen his understanding of Christian liberal ideology at seminary. Speaking from the pulpit, Dr. King learned how to captivate, move and incite people into action. 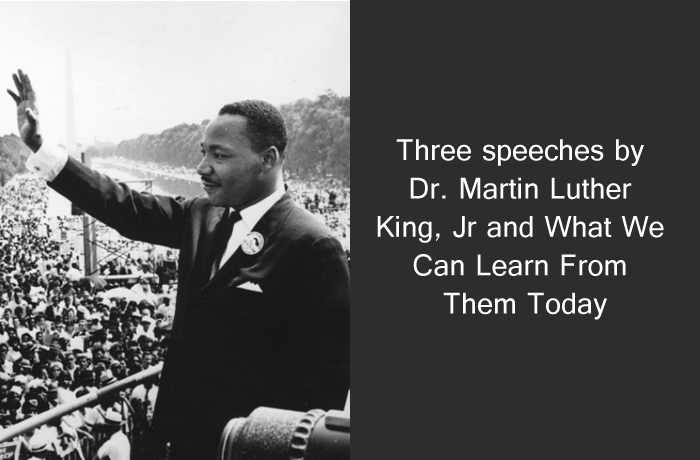 Although his most famous speech was “I Have a Dream,” delivered at the March on Washington for Jobs and Freedom in 1963, there are 349 other speeches worth noting. Here are three that may not be as “famous” but that are just as moving. On March 10, 1968, Dr. Martin Luther King addressed the Local 1199 union — comprised largely of African Americans, Puerto Ricans and other people of color (PoC) — in New York City. Dr. King called upon all people of color to unify in the fight for racial equality. It was his belief that all people of color are equally discriminated against and that we are stronger together than we are as smaller, splintered groups of African American only, Puerto Rican only, Asian only, etc. In the other America, there is disparity, poverty, joblessness and hopelessness. In the other America, people live in rat-infested homes, on dirty streets surrounded by drugs, gangs and violence. In their America, wealth, prosperity, happiness, privilege, excellent education and opportunity are taken for granted, while in the other America opportunity is replaced with being turned away simply because of race. In the other America, education is inferior, schools are falling apart and students are afterthoughts. In the other America, people of color can look forward to jail, drugs, rat-infested homes, poor education and early death. In contrast, in their America, people can look forward to becoming CEOs, politicians, entrepreneurs, doctors, lawyers and even president of the United States. In creating a utopia in their America, the other America languishes in hopelessness. By 1965, small pockets of anti-war movements started popping up on college campuses. Members of the leftist organization Students for a Democratic Society (SDS) kicked off their protests by organizing “teach-ins” intended to express opposition of the United States’ occupation in Vietnam, fighting a war that was not theirs to fight. An aspect of these protests that hadn’t been addressed that Dr. King raised in “The Casualties of the Vietnam War” speech was the impact on the African-American community. Early on, Dr. King had been a supporter of President Lyndon B. Johnson, but over time he came to believe involvement in the Vietnam War allowed the U.S. government to divert its attention away from problems at home, where people of color continued to live in poverty and continued to fight for access to opportunities white people took for granted. By fighting against North Vietnam’s right to secede from South Vietnam and become a communist nation, the U.S. was doing two things: imposing its brand of imperialism around the world and failing to address the growing disparities between the races in its own country. In Dr. King’s estimation, how can the U.S. impose its views and dictate how other countries conduct themselves when it not only can’t address the racial problems in its own country, but it actively creates laws that keep people of color institutionalized and without opportunity? In other words, how can the U.S. meddle in the affairs in other countries when it won’t deal with the problems in its own country? Many have speculated that “The Casualties of Vietnam” and a second speech Dr. King gave on April 4, 1967 called “Beyond Vietnam: A Time to Break Silence” led to his assassination exactly one year later. On Feb. 1, 1968, two Memphis sanitation workers, Echol Cole and Robert Walker, were crushed in the garbage collection truck they operated. The truck malfunctioned, killing both men. The tragedy was one in a long list of problems plaguing the all-black team of sanitation workers, the result of systematic abuse and neglect. Ten days later, 700 of them formed a union and agreed to strike. A week later, the Memphis chapter of the National Association of the Advancement of Colored People (NAACP) agreed to support the strike. There were hopes the strike would end swiftly, but Mayor Henry Loeb rejected the pay raise request on the grounds he didn’t recognize them as an actual union. The striking workers staged a non-violent march to City Hall, to which the Memphis police responded with mace and tear gas. By March, white high school and college students joined the striking sanitation workers in their daily march to City Hall. By March 18, the protest grew to 25,000 strong. On Feb. 24, 150 local Memphis ministers gathered to form the Community on the Move for Equality (COME), led by James Lawson, a local minister and ally of Dr. King’s. Hoping to get arrested, members of COME wanted to bring about more awareness to the situation with the striking sanitation workers. Kept apprised on a daily basis, Dr. King returned to Memphis on March 18 to utter chaos. Lawson and Dr. King led a march, but they were forced to halt all demonstrations as violence broke out. During the chaos, people looted shops and a police officer shot and killed a teenager. What happened next is almost indescribable. Police followed demonstrators back to the Clayborn Temple and released tear gas into the church. As demonstrators lay on the floor of the church trying to breathe clean air, the police entered the church in gas masks and used their nightsticks to beat them. Mayor Loeb’s response was to declare martial law and bring in 4,000 National Guard troops. Dr. King returned to Memphis on April 3 and spoke to some of the protestors. Martin Luther King Jr. was assassinated on April 4, 1968, the day after giving his “I Have Been to the Mountaintop” speech. If we are to examine the words and purpose of Dr. King’s speeches, in truth all of them could apply to current events. People of color are still fighting for equality. Things may be slightly better but, all in all, little has changed. This was originally published on Thanksigiving.com and is reposted with permission.